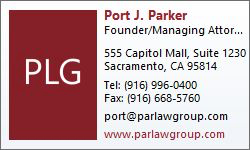 Port J. Parker formed Parker Law Group in January 2018. He has more than 23 years of experience in innumerable areas of law. He specializes in complex civil, tort, and probate litigation, with an emphasis on matters involving trusts/estates, corporate, professional malfeasance, breach of fiduciary duty (including legal, accountancy, trust/estate and real estate). He has also successfully litigated cases involving franchise, partnership, insurance, business and property disputes, as well as employment and securities related matters. After completing his J.D., Port joined one of the largest accounting and tax firms in the world, where he consulted for a diverse group of clients on accounting, business, tax and litigation. Port went on to become a senior partner at the nationally-recognized firm formerly known as Freidberg and Parker, LLP. Over the ensuing years, Port has distinguished himself as skilled litigator through hard work, tenacity and attention to detail. In the last 10 years alone, he has received more than $30 million in settlements, awards or verdicts on behalf of his clients, and has successfully tried or defended a variety of actions seeking over $100 million in damages. Port also has significant appellate experience, at both the state and federal level. Port also acts as General Counsel to a diverse group of businesses and clients, as well as leads the firm’s transactional and estate teams. Represented franchisor in contentious, multi-year dispute with disgruntled franchisees who sought damages and equitable relief. Tried to judgment, complete defense verdict, successful termination of franchisee and award of monetary damages to franchisor on cross-complaint. Represented corporation in cross-complaint, defense judgment obtained and award of over $100,000 in attorneys fees. Represented non-profit corporation in action seeking substantial monetary damages for breach of fiduciary duty and dissolution of partnership. Pre-trial dismissal of complaint with prejudice, with no payment of damages. Represented successor trustee to verdict in multi-million-dollar breach of trust and fiduciary duty case, defending millions in alleged damages. Represented a plaintiff in a partnership dispute, obtained a TRO-injunction, tried to verdict in a multi-day trial. The prevailing party sought almost $1 million in attorneys’ fees. Represented a defendant in an accounting claim against an estate and heirs, negated a $50 million claim and received an additional $9.5 million in exchange for partnership interests and a waiver of all claims. Represented a plaintiff in legal malpractice and breach of fiduciary duty case. Settled at policy limits of $4.25 million. Represented plaintiffs in a legal and accountancy malpractice action resulting in significant, confidential settlement. Represented a defendant in a conversion and breach of fiduciary duty action seeking over $50 million in damages. Tried to defense verdict. Represented defendant beneficiary and trustee in action seeking millions in damages against the defendant, with a pre-trial resolution resulting in the actual payment of significant moneys to the defendant and dismissal of all claims. Represented a plaintiff in an accountancy malpractice action. Settled at policy limits of $825,000. Represented a plaintiff in a fraud action. Settled at $875,000, including $625,000 in punitive damages, fees and costs. Represented a plaintiff in a fraud and breach of contract action. Tried to verdict and recovered $575,000 plus attorneys’ fees. Represented a plaintiff in a shareholder buy-out action. A settlement was reached at $1.27 million, whereas the best prior offer had been $100,000. In his spare time, Port enjoys contributing to the local legal community through such groups as the Anthony M. Kennedy Inns of Court, the Sacramento County Bar Association, the Consumer Attorneys of California, and the Volunteer Legal Services Program in Sacramento. He worked with the Sacramento County Bar Association to form a Professionalism and Ethics Committee and contributed as a member of the Association’s Appellate/Amicus Brief and Building Foundation Committees. When he is not working up and trying cases, Port also contributes time to the Sacramento County Farm Bureau Scholarship Foundation as member of their board of directors, donates time to his children’s school and other charitable causes. Port tries to stay active through sports, including tennis, golf, skiing and mountain biking. He also collects unique western tack and sports memorabilia. Port is admitted to practice in all California state courts as well as the Ninth Circuit Court of Appeals and the United States District Court in the Eastern and Northern Districts of California. Port received his Juris Doctor from McGeorge School of Law in 1995, where he was the Archie Memorial Scholarship recipient, received National Moot Court Competition and Trial Advocacy Honors, and was a member of the National Moot Court Honors Board. Prior to graduating, Port had clerkships in both the public and private sectors, including a year-and-a-half clerkship with the California Attorney General’s office in their Business and Tax Division. In 1992 he received his B.S.B.A. in Finance with honors from Northern Arizona University.